The downpour did little to dampen the spirits of thousands of city folks who watched the River Float Parade at Kuching Waterfront on the eve of Malaysia Day. Roads leading to the place were jam-packed with vehicles as evening fell and people braved the rain to get the best spots along the three-km-long waterfront to watch the event. Things were no different on the opposite side of the river, with huge crowds forming at Kampung Gersik and neighbouring villages to watch the parade and fireworks display. The Yang Di-Pertuan Agong Tuanku Abdul Halim Mu’adzam Shah and his wife Raja Permaisuri Agong Tuanku Haminah Hamidun made their appearance at approximately 9pm, accompanied by Prime Minister Datuk Seri Najib Tun Razak, Deputy Prime Minister Tan Sri Muhyiddin Yassin, Head of State Tun Muhammad Salahuddin and Chief Minister Tan Sri Abdul Taib Mahmud. After the opening ceremony in which His Majesty spun an authentic ship’s wheel to signal the start of the event, a unique water screen cinematic began to play much to the delight of audience. Images showcasing the progress Sarawak in the past five decades as well as its manifold accomplishments was projected onto a screen of water, making for a truly eye-catching sight. 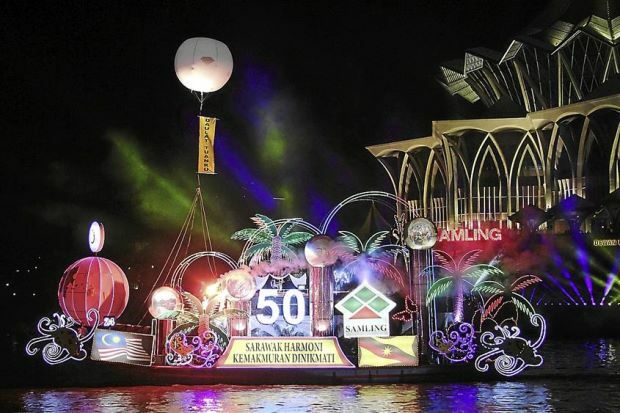 After an impressive light show and fireworks display, the fleet of 50 creatively decorated ships then sailed past the cheering crowd, with some sporting some truly noteworthy designs such as a huge moving mechanical hornbill, a platform featuring dancers and the state’s very own champion violinist Nisa Addina. A massive fireworks display which had many awestruck by its vivid colours blooming against the night sky and the shining State Legislative Assembly complex in the background brought the hour-long parade to a close. Broadcast live nationwide, the River Float Parade was indeed a great start to the Malaysia Day celebrations at Padang Merdeka yesterday.